Today’s Reno Gazette Journal had a front page article about Truckee Meadows Water Authority (TMWA) proclaiming that the Summer Water-use Savings Paid Off! We did good! Groundwater made quite a difference this year. The water cycle is the continuous process water goes through on earth shown in the diagram below. Surface water, primarily from oceans or other freshwater storage, undergoes “evaporation” into the atmosphere. Along with evaporation is “transpiration” (or evapotranpiration), where water vapor is also released from plants and animals. Also, “sublimation” occurs when frozen water vaporizes without first melting. All this water vapor is stored in the atmosphere until finally undergoing condensation when the air becomes sufficiently saturated, forms into droplets, and falls to the ground by way of “precipitation” in rain, snow, etc. Frozen precipitation is generally stored until it seasonally melts and joins other liquid water in streams, rivers, and other surface runoff as it makes its way back to the oceans or other freshwater storage areas. A portion of this surface runoff also sinks into underground aquifers, or groundwater, that also is eventually released into the oceans. The cycle then begins all over again. 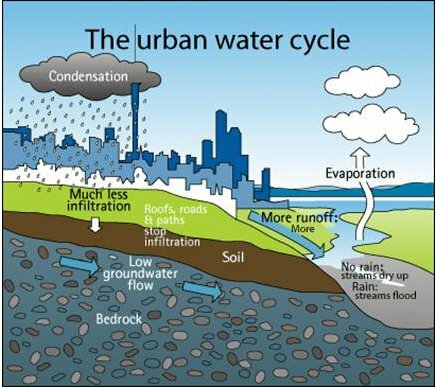 A printable PDF (11×17) of the USGS Water Cycle poster below can be found here. This entry was posted in ArrowCreek 411, ArrowCreek411, Conserving Water, TMWA, Truckee Meadows Water Authority and tagged ArrowCreek, ArrowCreek 411, ArrowCreek411, Conserving Water, Reduce Water Use, Reno Water Usage, TMWA, Truckee Meadows Water Authority, Water Conservation. Bookmark the permalink.